It is a pity that the book of Revelation has been turned into a money-maker for books and movies that are more science-fiction fantasy than Christian teaching. Revelation is used to create a timeline for all sorts of fantasies of destruction. What’s even more tragic is that while it’s easy to misinterpret the book of Revelation and indulge in fantasies of futuristic destruction, why is it so difficult to care about the present realities of destruction, especially the destruction of the environment? Yes, the Book of Revelation contains many visions of global death and destruction, but it belongs to a particular type of religious writing which was very popular in the time of Christ – what we call apocalyptic writings. We who read this book 2,000 years later do not share the mindset of the time in which it was written. I don’t want to trivialize things, but it’s almost like someone 2,000 years in the future, when human civilization is on the brink of calamity, people find a movie called Avengers: Infinity War and think it’s a prophecy about the end of the world. I know I’m being silly, but it’s not a completely unacceptable analogy. But thank God the Book of Revelation is not only about scenes of destruction. It starts with a dazzling vision of Jesus Christ. 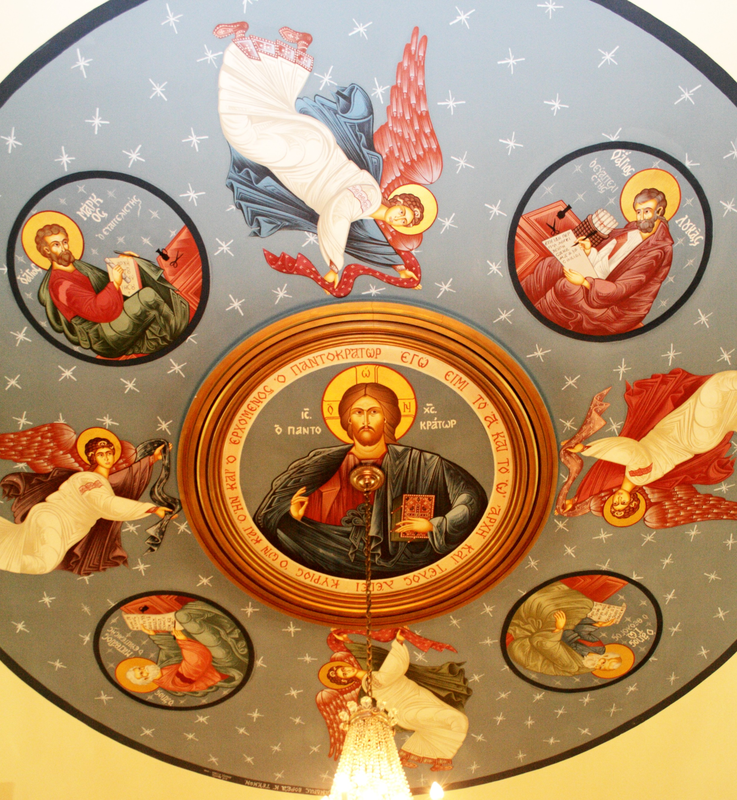 The words of verse 8 in chapter 1 are inscribed in red letters around our icon of the Pantokrator Christ in the ceiling of our church: “I am the Alpha and the Omega,” says the Lord God, “who is, and who was, and who is to come, the Almighty [Pantokrator].” Jesus dictates “seven letters” to seven churches in chapters 2 and 3 – which should prompt us and every church to wonder which of the seven churches are we most like, or what kind of letter Jesus would write to our church! Then follows a scene in the next two chapters of Revelation which can only be described as a heavenly liturgy. Indeed, the development of our own Liturgy was greatly influenced by the vision of chapter 4. 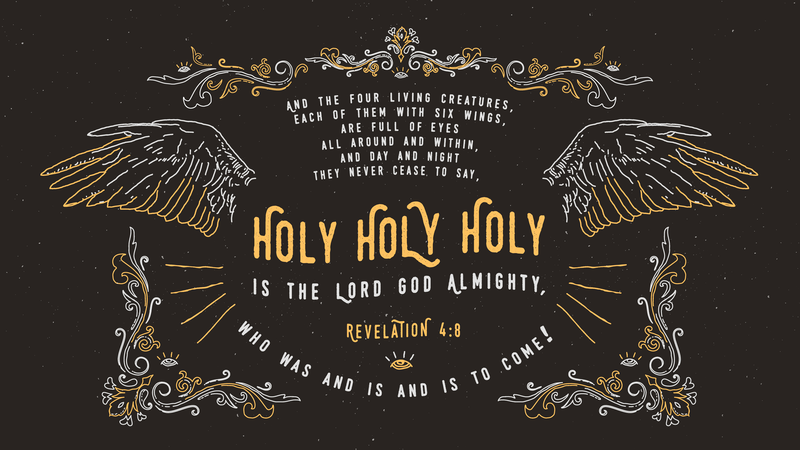 Our illustrated verse today (Revelation 4:8), in combination with Isaiah 6:3 and Matthew 21:9, became part of a hymn we sing at every Liturgy. It is perhaps a little known or rarely acknowledged fact that our entire Liturgy is permeated with words and phrases taken straight out of Scripture, both Old and New Testaments! The entire vision that John describes in the Book of Revelation took place on a Sunday: On the Lord’s Day I was in the Spirit (Revelation 1:10). And in chapter 4 he again reiterates: At once I was in the Spirit (verse 2). Of course he is referring to the Holy Spirit, the one whom elsewhere we have called the Comforter, the Helper, the Parakletos. The Holy Spirit can come into our lives in so many ways and in so many different situations of need or blessedness. We don’t tell the Holy Spirit how to impact our lives. The Holy Spirit is boundlessly free, like the wind in John 3:8. All we can do is call the Holy Spirit, be open to the Holy Spirit, just as John was on the Lord’s Day. And the Spirit showed him a vision of worship in heaven – certainly not a vision to be taken as something that happens for all eternity. It was a vision for that particular day or time in John’s life, when he was given to understand the mystery behind world events. And it was the unveiling of the mystery that gives his book the title Αποκάλυψις, Apocalypse or the Uncovering/Unveiling – or, Revelation in most English versions. The scene of worship described in our verses today and in all of chapter 4 sets the stage for the appearance of Christ as the Lamb in chapter 5, which itself marks the beginning of the incredible visions to come. Everything is an unveiling – but not necessarily an unveiling of any particular events, but rather an unveiling of the general movement of human history and human apostasy. But all that is beyond my ability to discuss today. We also call upon the Holy Spirit every Lord’s Day at the Liturgy: We pray to the Father to “send down your Holy Spirit upon us and upon these gifts here presented. And make this bread the precious body of your Christ….” The Holy Spirit changes the bread and wine into the Body and Blood of Christ. But what the Holy Spirit does “upon us” we don’t dare specify. One thing is for sure: the Holy Spirit acts in the life of everyone who is present on the Lord’s Day. Are you? Categories: Bible Reflections | Tags: Book of Revelation, Pantokrator | Permalink.